For those who want a foolproof way to achieve that gorgeous tan, are willing to pay extra for professional services, or are ready to purchase equipment specifically for this purpose, an airbrush tanning system might be the answer. Professional spray tans are often performed at tanning salons and spas by specially-trained personnel. There are two forms: airbrush tans and booth-spray tans. In the former, a professional technician sprays tanning solution on the customer, using a handheld sprayer. In the latter, the customer enters a booth wherein strategically placed shower jets spray tanning solution all over the body. An airbrush tanning system is more controlled, and promises the most natural-looking tan, without exposing oneself to the harmful rays of the sun. Application of the tanning solution is carefully regulated by the technician. A single application reaches for seven to ten days and since there are no UV exposure, the risk for skin cancer is eliminated. The active ingredient dihydroxyacetone (DHA) reacts with amino acids in the skin and a nice looking tan is developed without any fear of getting an uneven tan. 1. Luminess Tan – this airbrush tanning system is the no.1 brand, and claims to be the largest manufacturer of the said product in the world. It uses a highly-modernized airbrush system, as well as a well-formulated tanning solution. This solution also contains an instant bronzer for faster color. Their technology is aimed at giving you satisfaction for your money. 2. Scentual Sun Airbrush Tanning System – they have “The Eliminator III” which is a portable tanning system complete with a full body dryer. It can be set up and dismantled by one person in five minutes. Made of aluminum used in aircraft, it is state-of-the-art, and yet can be cleaned easily. Working together with this system is the Scentual Sun “Organiglow”, an all-natural, 100% organic tanning solution specifically formulated for airbrush systems. All of its ingredients are FDA-approved, it is water and aloe-based, alcohol-free, devoid of harsh chemicals, fast-drying, and is free from unpleasant odors. It delivers even, natural-looking color, is long-lasting, and even fades beautifully. 3. Sun Kiss Mist – both for professional and home use, this is the newest airbrush tanning system to hit the market. It boasts of its tanning solution made from superior quality ingredients. It combines DHA (Dihydroxyacetone) with erythrulose which helps yield a longer-lasting tan. The color is not a result of a stain, paint, or dyeing agent, but the chemical reaction brought about by the DHA and the amino acids found on the surface of the skin. 4. 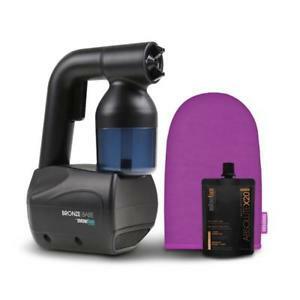 I-Bod Airbrush Tanning System – this has a rechargeable battery so it can be used practically anywhere. The charging time is very short, takes less than one hour. It works by covering the body with a fine mist that is quick-drying. The final overall look can be seen after about eight hours, and the resulting tan is good for seven to ten days. Like any other sunless tanner, it is advisable to wait for five to six hours before taking a shower. Whether professionally-administered or accomplished within the comfort of your own home, self tanning can be a success if a few pointers are followed: exfoliation before tanning, even and controlled application beginning from the bottom of the body, letting the solution dry completely before wearing any clothes, giving at least five hours leeway before showering or working out, and re-application if necessary.